The latest unemployment figures show the number of 16 to 64 year olds claiming Job Seekers Allowance in Bury North has fallen by 422 in the past year to 1,773. Chancellor George Osborne has updated MPs on the state of the economy and the government’s future plans in his Autumn Statement. Britain’s economic plan is working, but the job is not yet done – we need to keep taking the difficult decisions to secure the economy for the long-term. The biggest risk to Britain comes from those who would abandon the plan – and borrow and spend more. Our long-term plan will secure a responsible recovery for all. The key points are outlined below. Employer National Insurance contributions are to be scrapped on 1.5 million jobs for young people. 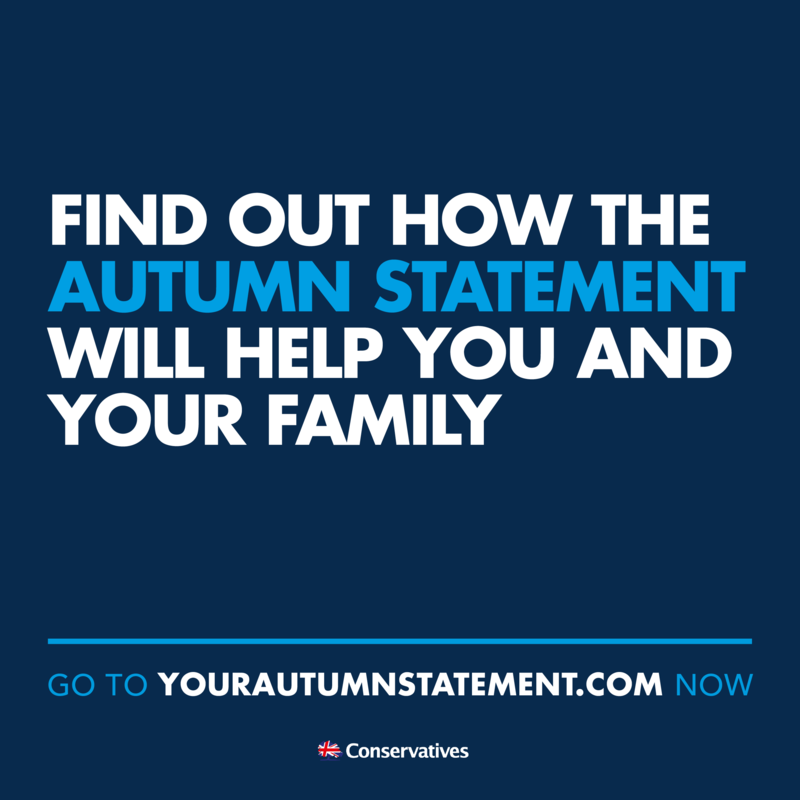 The personal income tax allowance will rise to £10,000 from April 2014, and then increase from 2015-16 by the Consumer Prices Index (CPI) measure of inflation. A married couples and civil partners tax break, which is set to cost about £700m a year, is proposed to start in April 2015, enabling people to transfer £1,000 of their income tax allowance to their partners. Business rates in England to be capped at 2% rather than linked to RPI inflation, with some retail premises in England to get a discount. Businesses moving into vacant high-street properties will have their rates cut by 50%. From April, a new tax relief is to be introduced for investment in social enterprises and new social impact bonds. The number of people claiming unemployment benefits is down 200,000, with unemployment now forecast to fall from 7.6% this year to 7% in 2015 much earlier than expected. Unemployment is then expected to fall further to 5.6% by 2018. Total number of jobs to rise by 400,000 this year and 3.1 million jobs predicted to be created by 2019. A boost in the government’s start-up loans scheme will aim to help 50,000 more people start their own businesses. Export finance capacity available to support British businesses will be doubled to £50bn. Petrol taxes stay frozen – a planned rise of 2p per litre by the last Labour Government for next year is to be scrapped. Regulated train fares will rise in line with inflation, not at 1% above RPI as planned. The tax disc to show motorists have paid vehicle excise duty is to be replaced with an electronic system. An extra 30,000 places at English universities will be created in 2014-15. The following year, the current cap on student numbers will be abolished entirely. Science, technology and engineering courses will receive increased funding, and a new science centre in Edinburgh University is to be named after Prof Peter Higgs, the discoverer of the Higgs boson particle. The proportion of young people from disadvantaged backgrounds applying to university is up. An additional 20,000 apprenticeships are to be funded over the next two years. All pupils at state schools in England in Reception, Year 1 and Year 2 are to get free school lunches from next September, at an estimated cost of £600m a year. The state pension age is to increase to 68 in the mid-2030s and to 69 in the late 2040s. In April 2014, the state pension will rise by £2.95 a week. Overall welfare spending is to be capped. Anyone aged 18 to 21 claiming benefits without basic English or Maths will be required to undertake training from day one or lose their entitlement. People unemployed for more than six months to start a traineeship, take work experience or do a community work placement or lose benefits. The government hopes £1bn in loans will boost housing developments in Manchester and Leeds, among other sites. Councils are to sell off the most expensive social housing and rundown urban housing estates to be regenerated, and workers who live in council houses are to be given priority on housing lists if they need to move home to find a job. The forecast for economic growth this year is 1.4%, then 2.4% next year and then maintained at 2.2%, 2.6%, and 2.7% for the next 3 years. The UK’s “underlying” deficit – has been revised down by the Office for Budget Responsibility (OBR). Borrowing is expected to come in at £111bn for this year, falling in 2014-15 to £96bn, then down to £79bn in 2015-16, £51bn the year after and £23bn the year after that. By 2018-19 there should be a £2bn surplus. Departmental budgets will be cut by about £1bn next year and the year after to help cut the deficit. Tax allowances aiming to encourage investment in shale gas to cut tax on early profits by 50%. More investment in “quantum technology”, which involves attempting to apply the strange behaviour of materials on a tiny scale to practical purposes, is promised. The government’s pledge to spend 0.7% of gross national income on international development is to be met without an increase to the current aid budget. Calling the people of Bury, Tottington and Ramsbottom. Give yourself a warm glow in the run up to Christmas. Support our local small businesses this Saturday – 7 December 2013 on “Small Business Saturday”. “Small Business Saturday” is about reconnecting people with the small businesses in their local areas and demonstrating the enormous value that they bring to individual customers and to the UK as a whole. The vast majority of companies in the UK are small businesses and they provide two thirds of all private sector jobs. Small firms don’t have the public profile and marketing budgets of large corporations and Small Business Saturday is an excellent way to celebrate small businesses and support them in showcasing their products and services to local communities. We want to see Small Business Saturday raise the profile of our local small businesses so that residents and businesses alike begin to think “small first”. 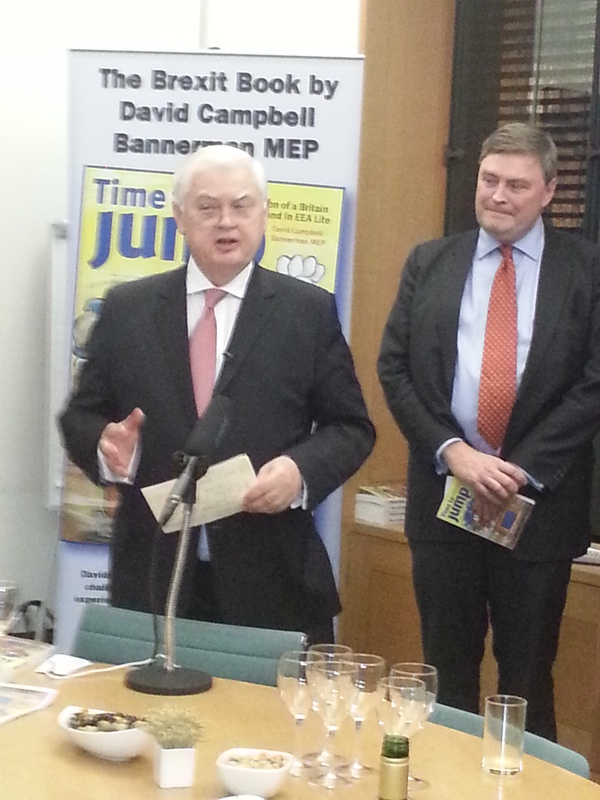 My final engagement today was to call in on the launch of a new book by David Campbell Bannerman MEP. The book sets out a positive vision of what life could be like for Britain outside of the EU. After an introduction from my fellow Better Off Out member Peter Bone MP and a few words from the author there was a speech by the Rt Hon Lord Lamont former Chancellor of the Exchequer who wrote the foreword. he set out why he believes the fears business have about life outside the EU are completely misplaced. Once businessmen realise that the EU will not close their markets to us (principally because they sell more to us than we buy from them!) they will soon want to increase their investment in the UK as they will be able to benefit from access to the EU just as they can now without having to comply with rules and regulations that they do not have to comply with elsewhere in the World. Today ( after returning from channel 5 and dealing with the latest batch of emails and letters) I went to a briefing from the Post Office. With over 11,500 branches the Post Office has a physical and personal presence right across the UK. After thousands of branches closed under the last Labour Government including several in Bury the Coalition has called time on future post office closures and instead pledges hundreds of millions of pounds to modernise the post office network and secure it for the future. In future instead of having a one size fits all model for post offices there will be different types depending on the location of the branch. Many people do not realise that with the exception of a few Crown Post Offices most Post Offices are actually privately owned small businesses. Main branches will offer a modern environment selling the traditional range of Post Office items including financial services and in many cases they will be open longer hours than they are currently. Channel 5 are the only public service broadcaster in private hands and are the smallest of our public service broadcasters. I spent the morning meeting with various key personnel from the Company and hearing at first hand the challenges they face. We are very lucky in the UK to have such a vibrant broadcasting industry but we must not be complacent. All the broadcasters who are not funded by the licence fee have constantly to look for ways to protect their revenues and I have been particularly interested in the effect of Ofcom regulation has on the business model.